A widow in Orissa’s Jajpur district died of starvation after remaining bedridden for several days, a village leader said Thursday. Seventy-two years of age, Kolhanai Bewa, died at her village Mahisara last Tuesday after she did not get food sufficient food to survive, local village council Chief Sudharsan Behera said. She was without food for three days before her death, he said. Bewa’s health started falling after her only son Shiv Sethy 40, developed illness couple of months ago and lost his business. Shiv, a married man was the sole breadwinner for his five-member family besides his mother. Being shoved to poverty himself, Shiv struggled to look after his wife and three children and consequently Bewa got left out completely, he said. She was old and died of illness, local block development officer Bijay Ray said. But according to another village leader and former local village council chief Niranjan Behera more families in the village are facing starvation and likely to meet similar fate, if proper care is not taken immediately. The village council had identified at least thirty poor persons in December last year and had recommended the local administration to cover them under the centrally sponsored ‘Antodaya Yojana’ scheme as beneficiaries. As per the scheme, the identified villagers are supposed to get identity cards from the administration. The card makes each of them entitled to get 30 kg of rice at the rate of Rs.3 per kg. Regarding this matter, the village council passed a resolution and communicated it to the block authorities but with no effect, he said. Further, the people in plight met the Jajpur District Collector Arabinda Padhi last month and apprised him about their hapless condition. But this meeting failed to extract any kind of humanitarian assistance from the administration for these utterly poor citizens. Without having any other alternative for their survival, they resorted to begging. ‘If administration had given Bewa an ‘Antodaya’ card she would not have met such a tragic end,’ Behera alleged. The district administration acted only after the news about the death of Bewa spread. On Wednesday, the local administration rushed two officials to distribute ‘Antodaya’ cards to the identified villagers. But the villagers were angry at Bewa’s death. They detained the officials for over three hours and did not accept the card. The district administration has now ordered an inquiry into the woman’s death. Ironically the coastal district of Jajpur is considered as one of the most sought after industrial destinations where most of 43 companies, which had signed deals for steel plants with the state government, are going to set up their plants. 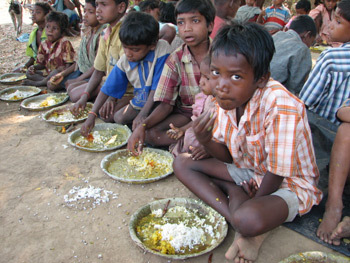 Orissa’s western districts of Kalahandi, Koraput and Bolangir are considered to be some of the most economically backward areas of the country where incidents of starvation deaths and child sales by poor parents have been common in the past.